I wasn't, and I apologies if my post gave that impression. 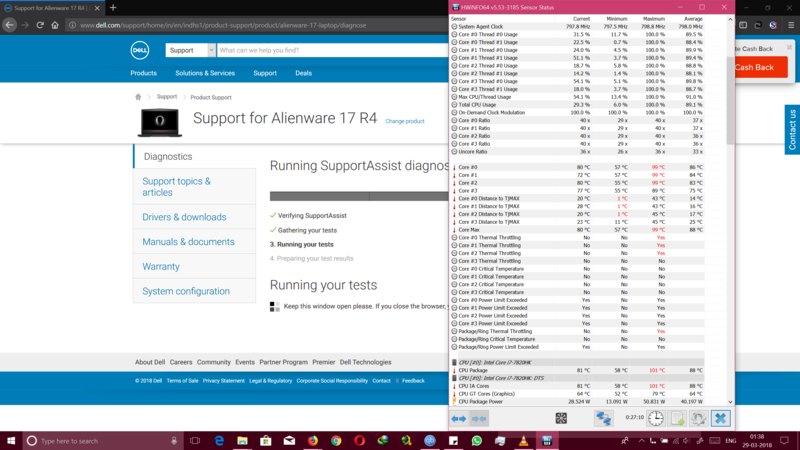 I was just trying to compare the difference in response of Dell UK and Dell India, and the good job that former did with my machine. I really thought you had 17 r4 when you said you had similar config to OP's. dm477 and Vistar Shook like this. Ah that was badly phrased. My apologies. I have an Alienware 17R4 7820hk+GTX1080 version laptop. It is heating and thus throttling. CPU temps are reaching 100C while on load. It also stutters after playing for 5 min only. This is the image that shows the temperature. Also, cpu3 has temperature differential. The ambient temperatures in India reach 44C where I live. Can someone suggest how to keep my system cool? I also made a video that shows how laptop restarts when playing game. To clearify whats happening here. 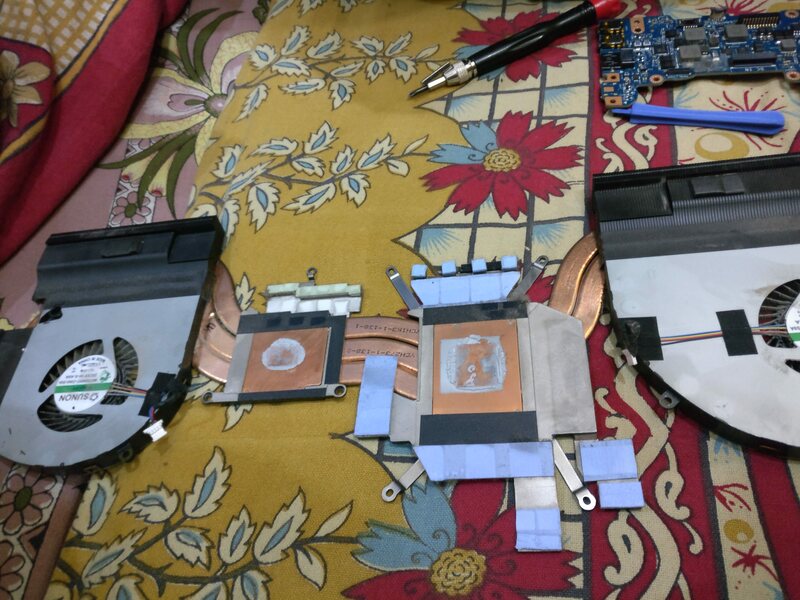 The shared heatsink design causes a really bad glitch when not pasting the CPU properly. 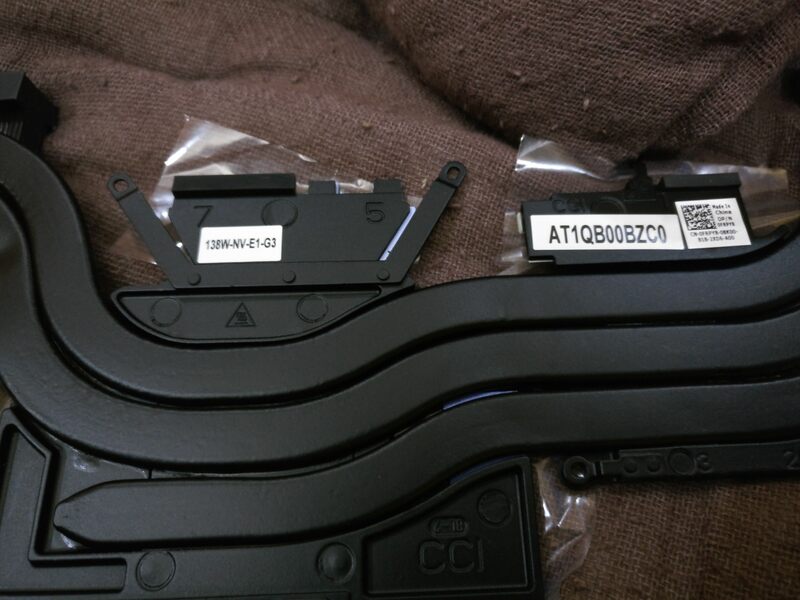 If the tim gets bad on the CPU the shared heatsink will suddenly use the CPU mount as a heatsink. 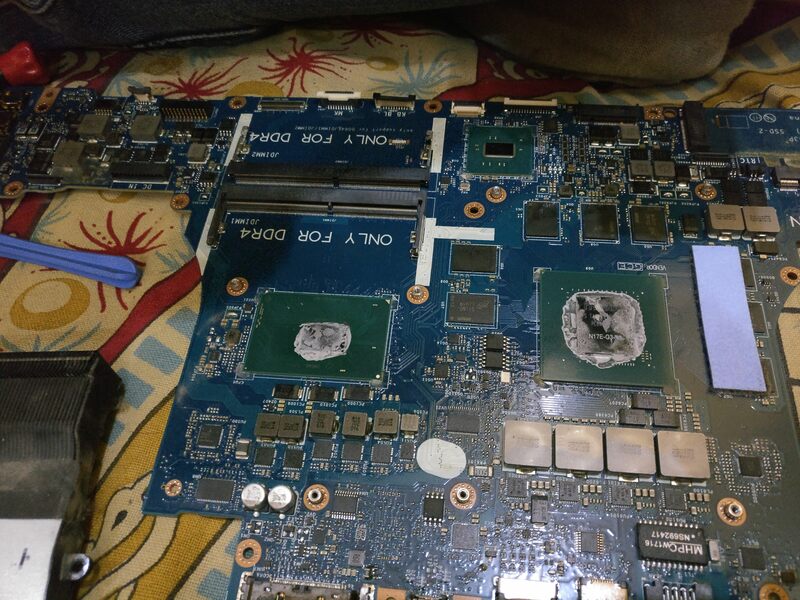 It's a normal design flaw, you can easily fix this by using good thermal compound such as IC Diamond and Gelid GC extreme. To prove my point. Try a GPU only intensive task such as Furmark (don't run this to long, it can break ur GPU over time) or 3dMark etc. You will see that even tho your CPU doens't do anything it gets heated up by the graphicscard to over 90c. So the tech came today and replaced the heatsink and motherboard. 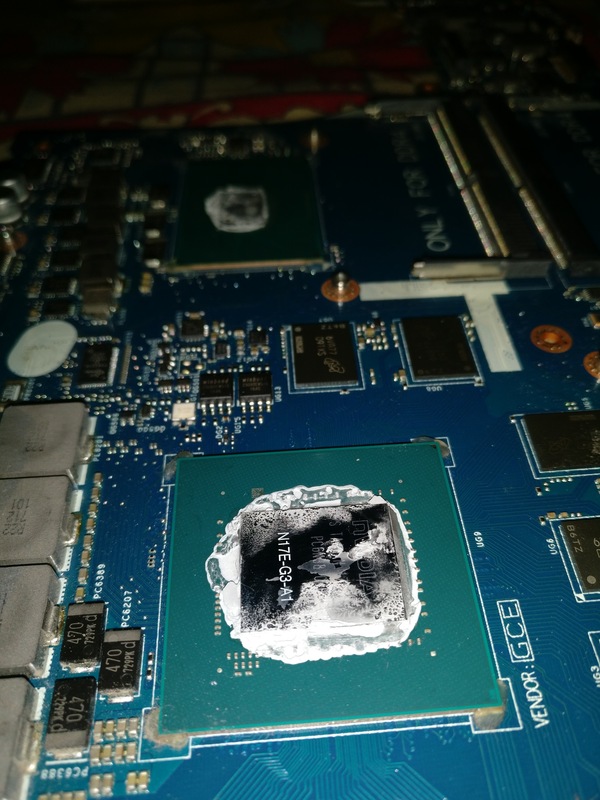 The paste on both the CPU and GPU had dried completely. See the images below. For now the temps are amazing. I did a stress test on Aida 64 w/o under volt and temps did reach higher 80s but after undervolting they never reached above 82c with 4.1GHz overclock. Core temp differential is also about 5c within each other. I'll stress more and share a screenshot soon. 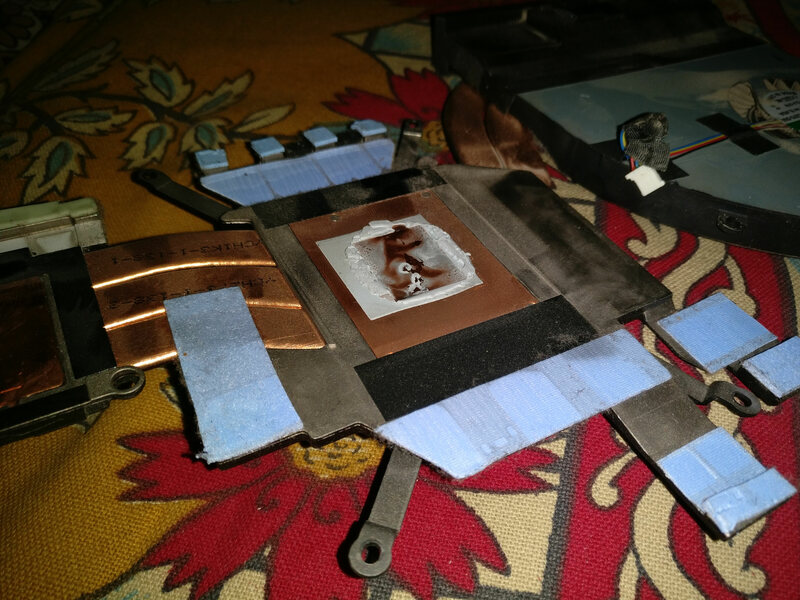 @alexnvidia for your post this is the new heatsink that was replaced in my system. rinneh, Vasudev and Vistar Shook like this. Good temps but can be better. Maybe CPU performance mode can help. Did you contact @Vasudev or @Vistar Shook to see if they can do the service for you? Om aw r4 bener bener kacau heat nya ya . Emang Semua produknya ,gimana rata ratanya om? ?